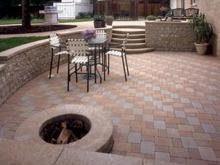 Suma Designs is recognized as the premier masonry services company throughout Connecticut. We are committed to delivering the finest craftsmanship at competitive prices. Through the years, our operations have expanded to include a broad range of building masonry restoration, construction and consulting services. We specialize in restoring exterior and interior installations of brick, stone, terra cotta and concrete. Our team is knowledgeable about historic masonry restoration, new masonry construction and concrete restoration guidelines and requirements. Suma Design's vast experience and expertise in masonry services will set your home apart with creative and beautiful projects for your outdoor spaces. After an initial free consultation, we'll produce layouts and ideas for your project. Our highly-skilled team of respected masonry experts, will then work quickly and diligently to bring your landscape plan to life. Suma Design's has been providing quality masonry services for many years and we're looking forward to helping you transform your ideas into reality. Despite the fact that the Suma team spends most of its time and resources completing total home renovations, there is no job too small to call on their expertise and experience. We look forward to hearing from you. Call us today for a FREE constultation (203) 270-1097. "Calvin Blackwell (Suma Designs) is a professional, trustworthy, hardworking, intelligent, compassionate, organized man who has a work-ethic that is hard to match. His attention to detail is impressive as well as his ability to manage costs while completely and clearly outlining any additions/changes if needed or requested by the homeowner. We have done several jobs with Calvin, and each time he has offered recommendations to not only improve the outcome but also to ensure on or below budget spending. The people that work with Calvin are also professional, respectful and neat. Throughout the 9 years that we have worked on and off with Calvin, we have recommended him to friends who have also had very positive experiences. Once a job is finished, Calvin takes the time to follow-up to ensure you are happy not only on the finish day but long afterwards as well. He is a true professional and a man of character. Any job he would do for you would be managed and completed to a top level of quality."